Of everything that Trader Joe’s has attempted to cram pumpkin into, Trader Joe’s Pumpkin Green Yogurt has surprised me the most. Pumpkin in waffles? There’s precedent for that. But pumpkin in yogurt? Any member of the squash family, really, has no place being blended into thick, protein laden yogurt. Of course we’re talking about the food engineers at Trader Joe’s labs who didn’t shy back from merging pizza and veggie burgers so it was unlikely their hand would be stayed here either. To get right into it – pumpkin does not marry well to the tongue-enveloping cloak of greek yogurt. I like pumpkin as much as the next man, and I’m certainly a lover of greek yogurt, but they simply do not play well together here. Let’s start with the first issue – what does pumpkin really taste like? The squash family as a whole isn’t known for overwhelming people with blasts of flavor. While pumpkin does have it’s own sort of mild, intriguing charm it isn’t really a natural candidate to jazz up plain, unflavored yogurt in the same way that, say, strawberries and pineapple are. What people generally respond to, when you’re talking about pumpkin are the spices and sugar that get mixed in with it – pumpkin pie, more than pumpkin. Trader Joe’s tries very hard to deliver this – in addition to the pureed pumpkin (the second ingredient), they’ve also added nutmeg, cinnamon, ginger and cloves. So really what we’re talking about is not pumpkin flavored greek yogurt, but pumpkin pie flavored greek yogurt. This doesn’t really seem like all that daunting of a task to deliver on – Yoplait manages to pull off a huge number of pie flavors in their yogurts, from Boston cream to lemon chiffon. But yoplait isn’t interested in delivering you a healthy, non-fat, greek yogurt like Trader Joe’s, and it’s in pursuing that course that TJ’s managed to trip themselves up. This yogurt tastes, first, strongly of the slightly sour yogurt cultures you’d expect, then a bit of generic pumpkin spice, then very faintly of pumpkin. And that’s about it. None of the jazzy pep of the more flavorful, fruit variety yogurts you offer. Just a long, lingering, slightly sour taste in the mouth.It’s possible that if this were not a non-fat yogurt, if it had a richer, fuller body, there might have been more room for the pumpkin pie spices to play out, but that’s nothing but conjecture at this point. I get it, Trader Joe’s, you love pumpkin! But let’s take a good look at just the non-fat greek yogurts you already offer – honey, mango, blueberry, vanilla, strawberry and pomegranate. Why are you adding pumpkin to the mix? To impress people with your boldness? What if you succeed and people buy it, just out of curiosity? Don’t you think it’s important that the yogurt tastes at least as good as your other yogurts? I’ve tried all of your other non-fat greek yogurts, and I can safely say this is the least enjoyable of them all. Worse than pomegranate, TJ, worse than pomegranate. You know me, I’m all for boldness. I’m all for embracing the wild and unknown. But you also have to know when you’re challenging the status quo and when you’re just peeing into the wind. 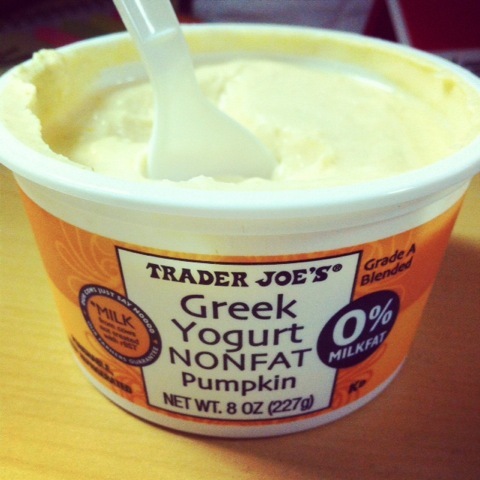 Trader Joe’s Greek Pumpkin Yogurt is, despite all their enthusiasm and good intentions, the latter. Would I Recommend It: To no one but the pathologically motivated Trader Joe’s pumpkin perfectionist. Would I Buy It Again: Not this year, not next year. 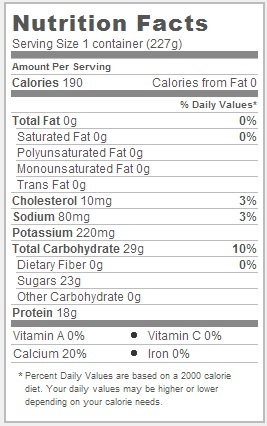 Final Synopsis: Non-fat greek yogurt is just one of those things that doesn’t need pumpkin in it.